Prime Minister Narendra Modi on Sunday asked the small entrepreneurs to go eco-friendly during the festival season and same time urged the nation to support these small and young entrepreneurs by purchasing their products. 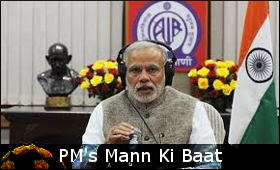 Go eco-friendly...as festival season has begun across the country and hundreds of families in small household units start making Rakhis...diya...sweets...clay idols and many more, PM Modi said during his radio address 'Mann Ki Baat' which is broadcast every last Sunday of the month. He said, "Festivals lend a sweetness to our relationships, bring a warmth of togetherness in the family and foster brotherhood in society. They connect the individual with society. It is a natural journey from the self to the collective. And the 'I' gets an opportunity to transform into a 'We'." "As far as the economy is concerned, hundreds of families start making Rakhis in small household units, many months before the festival of Rakhi. A variety of Rakhis are made in a whole range of materials, from 'khadi' to silken threads. People prefer homemade Rakhis these days. Rakhi makers and their sellers, sweets shops vendors â the professions of hundreds, thousands flourish on the occasion of a festival." He said, "The households of our poor brethren and their families are dependent in a way on these activities." "When we light a 'diya', an earthen lamp on Deepawali, it is not merely a festival of lights, a festival that illuminates the entire house; it is directly connected with those poor families who make small 'diyas' or earthen lamps. Today as I speak about festivals and how they are linked to the economy of the poor, I want to touch upon the subject of environment as well," PM added. PM had talked about eco-friendly Ganesha idols during the festival of Ganesh Chaturthi. He said, "We must lend strength to that spirit and at the same time resolve to use eco-friendly clay Ganesha idols, to protect the environment." PM was sure that nation would join him. He said, This will surely benefit our poor artisans, and artists, and provide employment to those who make idols. The poor will be able to earn a living and feed themselves. While urging the people of country to support theses household enterprenures, he said, "Come, let us link our festivities with the economic welfare of the poor, let the joys of our festivals connect with the households of the underprivileged, bringing monetary happiness to the have-nots. This should be the endeavor of all of us." "I extend my best wishes to all my countrymen for the various upcoming festivals and celebrations," PM said. Pumps buyer in water related sectors Govt. P.S.U. and Min. still adding prefer make in its tenders. They are not approving SMEs for future requirements. User should approve after checking qualifying by their consultants or third party inspection agencies. They do not want new suppliers as on the direction of Big Companies.